Ok, so now you’ve hired your bookkeeper or you at least have an idea of who you want to hire and now you’re wondering how to make it work. 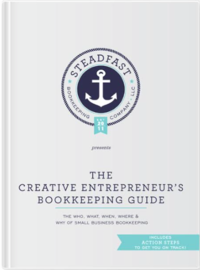 Since it’s likely that you are outsourcing to a company like Steadfast (I hope we got the chance to speak to you), it’s very important that you create a partnership that is beneficial to both you and the bookkeeper. This will be a long-term relationship and we all know money isn’t the easiest thing to talk about / deal with so it’s best to get started on the right foot. You are in this together and your bookkeeper should have your best interest and the best interest of your business at heart. Based on how much your bookkeeper is handling, they will certainly need items that only you can provide. Keep an open line of communication and respond to requests in a timely manner. Provide documents that are requested and be sure to also provide access to online accounts so they can access statements and transaction details. Most bookkeepers will have specific ways or tools that can be used to collect the info they need – be sure to utilize these when requested. Your bookkeeper should keep you up to date on anything that is going on with your account and will likely provide reports after the end of each month. Be sure to review these reports and ask any questions you might have. No question is a dumb question so go ahead and ask – we LOVE to discuss numbers and won’t mind one bit if we have to explain things! By working together you’ll create a lasting partnership and you’ll never have to worry or feel frustrated about your bookkeeping again.